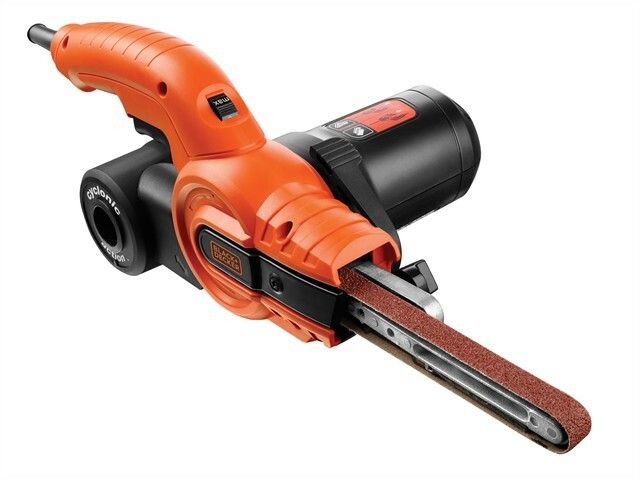 Black and Decker KA900E Powerfile™ Belt Sander with a 13mm sanding belt, that is ideal for sanding, shaping, filing, sharpening and rust removal applications. Variable speed for optimal control and finish when sanding wood, metal, ceramic tiles, masonry, plaster and plastic. Cyclonic action dust canister, for efficient dust collection and a cleaner work area. Has a powerful 350W motor enables optimal stock removal to get the job done quicker. The narrow arm allows for work in confined spaces, and has a screw operated belt tracking makes the sander easy to operate and prevents the belt from coming off the rollers during operation. Applications: sanding curved surfaces, shaping wood, removing excess weld, filing down nails and screw heads, cleaning out apertures e.g. door locks, shaping ceramic tiles, removing rust, sharpening blades.